Reading Lists Online provides you with the autonomy to drive selection and purchasing of the resources you want for your library collection. Since November 2017, the Academic Engagement team have run small group training sessions, which have led to many Academic staff instantly creating, publishing and personalising lists to suit their module structure and enhance teaching and learning. As this is a web-based tool many Academics have not just been adding e-books and full-text journals etc. but also links to online training resources such as Lynda.com. You can find additional information on Reading Lists Online, including how to get started on our Learning Services Wiki or please contact your Academic Engagement Specialist. Edge Hill staff and students have free, unlimited access to Lynda.com, which includes thousands of high quality online courses and video tutorials written by industry experts. We caught up with two members of staff from the Computer Science department to discuss how they use Lynda.com to enhance their own skills and the learning experience of their students. Chris Nicholas is a Computer Science Research Assistant. He has used Lynda.com extensively to improve his knowledge of software development. Oladotun Omosebi is a Computer Science Doctoral Tutor. He has used Lynda.com with his students to help them improve their skills in using various software. Learn more about Lynda.com through our Lynda web-pages and explore the wide range of content for yourself. 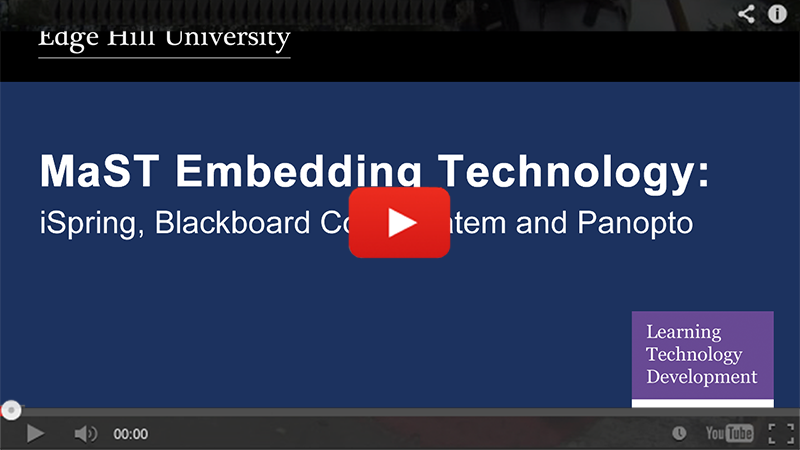 Blackboard Collaborate is an online classroom tool. It is designed to allow presentations and tutorials to be given to students while they are off-campus. In this blog post we look at an unusual use of Collaborate, as it was used to run a ‘blended’ conference. Meg Juss: Could you set the scene for us? 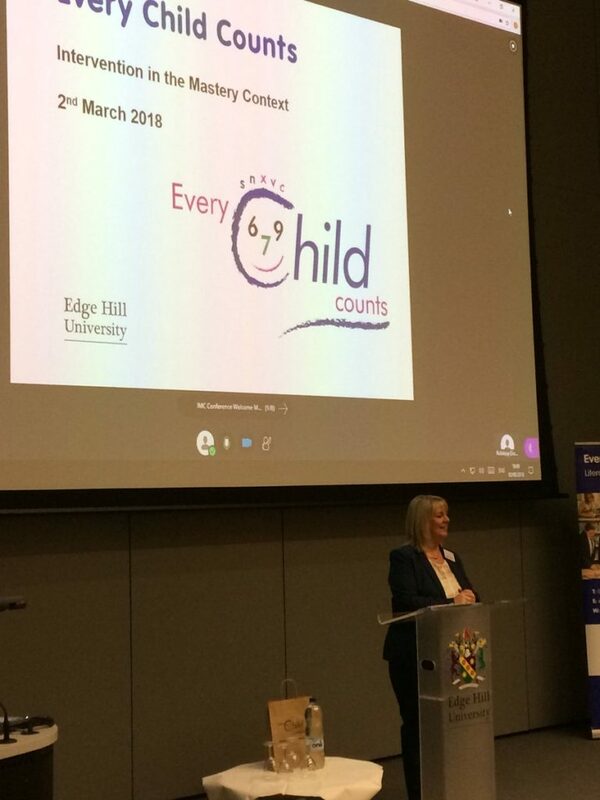 Peter Beaumont: The Every Child Counts conference had been organised to run at Edge Hill University in early March 2018, with speakers coming from all over the country. However a day before it was going to run it was clear that due to snow, with red and orange weather warnings in many parts of the country, most of the presenters and many attendees were not going to be able to make it. MJ: Can you explain what we did? PB: First we posted to the very helpful ALT-MEMBERS mailing list to ask for advice from the learning technology community. It was useful to read personal experiences of others, and the advice influenced some of the specific decisions we took. The key thing for us was to enable the speakers to present from home, but we also wanted distance attendees to be able to experience and take part in the conference as much as possible. We decided to try and run the conference through Blackboard Collaborate. Speakers would present through it, and their webcam video and slides could be displayed on the big screen in the lecture theatre, as well as on distance attendees computer screens. Distance attendees could post questions in chat when it was time for post-presentation questions, and we used a Catchbox microphone to ensure that questions asked in the room, could be heard at a distance. MJ: What were the issues and concerns? PB: Because the conference was suddenly moved online, presenters’ slides were not created with Collaborate in mind. 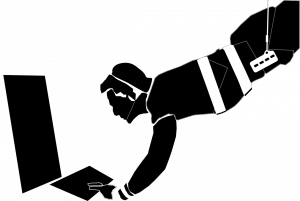 Animations don’t work as slides are converted to images, and videos need taking out of the slides and presenting another way. The presenters were fantastic and flexible and spent extra time changing to fit the limitations of presenting this way. Obviously in an ideal world we’d want to work with presenters to make the most of the technology, rather than be limited by it, but there just wasn’t time for that. There were some distance attendees who were finding that slides were not updating, and we worked with Blackboard to identify that these users were not using the Chrome browser. Although we sent out instructions advising the use of Chrome, we identified two issues which we will need to consider in future. Not all users have an understanding that different web browsers are available, and I think their mental model of using the web is that they click on the ‘e’ to ‘open the internet’. The other thing to consider is the amount of pre-conference information that can you send to attendees before you get into a TL;DR situation? Finally, even with wonderful, understanding and flexible presenters, unexpected things can happen. For example a presenter in the room might do something in the room which cannot be followed at a distance, for example writing on a flip chart. When that happened at this conference, we copied what was being written using the Collaborate annotation tools, allowing the distance attendees to follow. There are moments like that when you are a bit unsure what you are going to do. MJ: What would be your advice to others trying to do this? PB: Running a ‘blended’ conference felt successful and we got good feedback from attendees, but we did have three people working on Collaborate all day during the conference, and spending the day before planning, and speaking to the presenters. One person was supporting the presenters, doing things like switching between the slides and the videos, switching the room mics on so distance presenters could hear the audience during discussion times, and operating the Catchbox mic. One person was at home, meaning they were aware of how the distance attendees were experiencing the conference, and they offered support to those having issues, as well as advising the people supporting the conference on campus of how it sounded and looked. The third person, was monitoring chat to collect questions from the distance attendees, welcoming and supporting attendees, copying what was written on flipcharts, etc. This sort of support, from people who understand the Collaborate system, is not often available. You need to prepare online presenters in advance, so that their slides and planned activities are appropriate for the presentation method. Presenting online doesn’t have to be a worse experience than a face-to-face presentation, but you need to understand the strengths and limitations of the medium. A lot of small things are quite important too. We found that putting some ‘elevator’ music on in the room between sessions, gave some feedback to distance attendees that they were in the right place. We made sure that Collaborate notifications are turned off on the presenter PC at the front, so that it was not bleeping as people entered and left the session. Collaborate is a good solution to enable people to present online, but you need to be aware of the risks. If the presenter’s home internet is poor, then the session could be frustrating for attendees to follow. The Every Child Counts team very wisely had back-up plans for an alternative session, in case something went wrong. However, there are risks with face-to-face presentations too, as we saw with this conference. There is no reason to be scared of online presentations, as long as you and the attendees are prepared. MJ: Can you share any quotes with us? 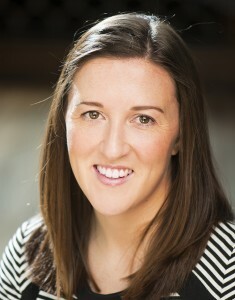 Natalie Reynolds is a Senior Lecture in Secondary English. 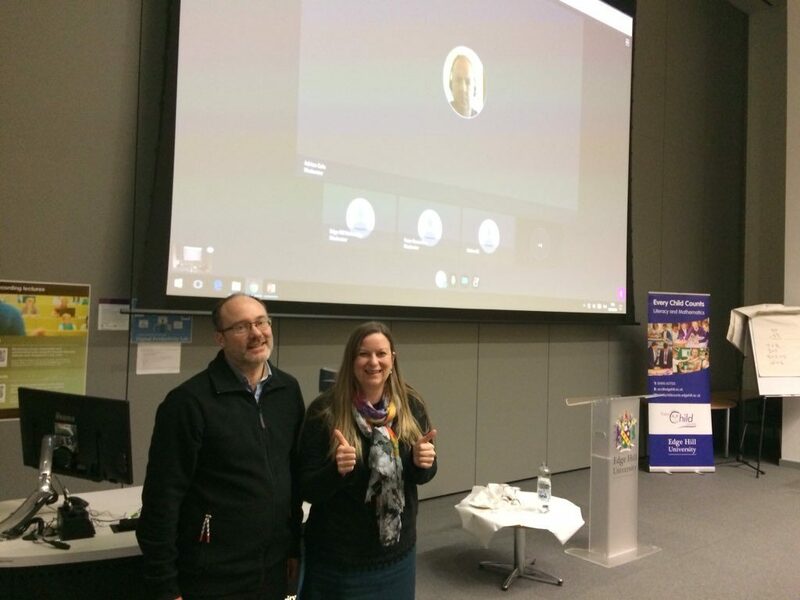 Natalie was introduced to lecture capture software (Panopto) during her own studies and immediately wanted to explore its potential on the programme she teachers here at Edge Hill University. Panopto software provides lecture capture, screen-casting, video streaming, and video content management solutions. 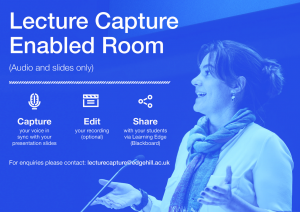 The Panopto lecture capture system is now available for use by staff in faculties as an additional learning tool for students at Edge Hill University. Natalie is passionate about teaching and the importance of exposing students to some of the best and latest technologies to support their learning here at Edge Hill University. 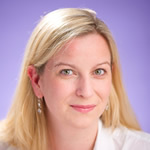 In this short YouTube video, Natalie talks about her introduction to lecture capture software and the use of Panopto in her teaching. 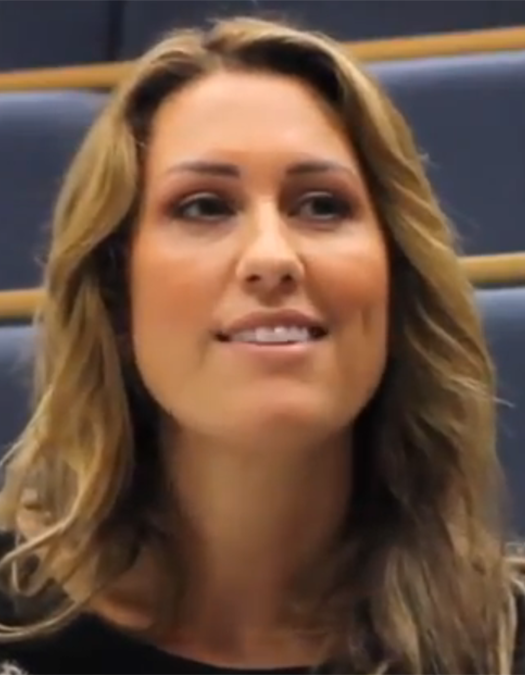 Hear what Natalie has to say, in this short video interview, about her first experience of Lecture Capture and the Panopto for Education software. “My Name is Natalie Reynolds, like every teacher I want all my students to succeed in their studies regardless of where they are and how they learn. I needed a platform that would enable my students to access a key lecture regarding starting their Professional Practice placement and was introduced to Panopto by a Learning Services presentation. I felt that even if I would have emailed the PowerPoint that would accompany the lecture to my trainees individually (in addition to it being uploaded onto Blackboard), there would continue to be questions coming in from trainees when situations occurred during their placement. 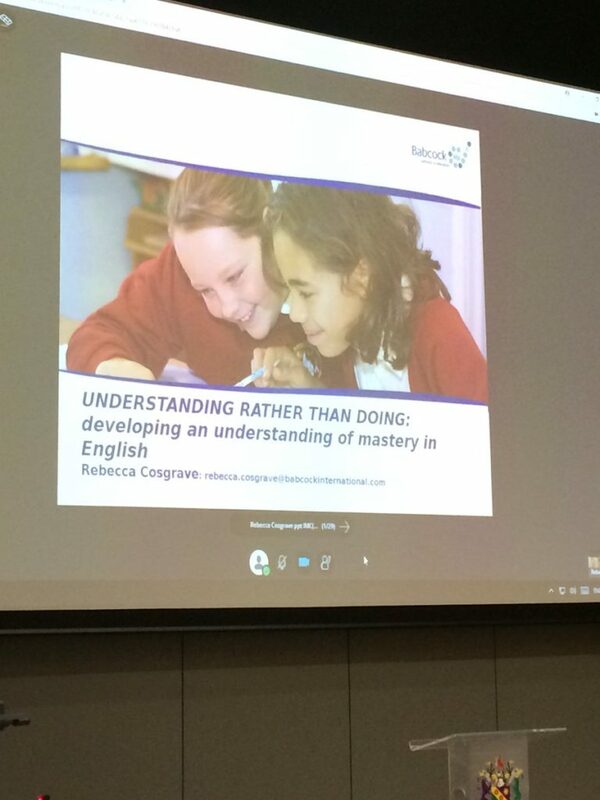 In light of this, I decided to record the session using Panopto however I also planned a flipped learning session and was then able to add further information (trainee presentations) into the recorded session after the original lecture took place. The result of using Panopto was that my trainees were able to access the session when they needed it and not when I sent it to them. The fact that content was added in after the initial lecture (trainee presentations) gave them further ownership of the piece and made them more willing to access the content. The impact of using Panopto for this particular session was that it significantly reduced the volume of emails I received with questions about placement issues: trainees were able to access the recorded session and go straight to the information relevant to their situation. The other significant point is that trainees were able to have answers to these questions immediately, regardless of what time their question was posed as the recorded session is available on Blackboard. For key sessions such as the one outlined, I would have no hesitation in recording the session so that it can be accessed straight away by trainees at a later date, at a time when they need it. If you feel inspired by Natalie’s story and want to use this or another technology to help you enhance and support your own teaching, please get in touch with the Learning Technology Team in Learning Services. We would be very happy to work with you. Lecture Capture…What’s in a name? Claire Moscrop is a Senior Lecture in The Centre for Learning & Teaching. Claire was until recently a Senior Lecturer in Computing, as a result of the continued increase in student numbers in this area, Claire was intent on maintaining student engagement for her sessions, particularly as the increased numbers meant moving from small seminar rooms to larger lecture theatres. Claire is an advocate of technology, as long as it helps to get the best from her students. Claire wanted to utilise students own devices in her sessions to encourage students to be engaged and responsive during lectures. An online solution was sought to minimise the impact on growing numbers, and also due to lack of suitable in-house clicker systems. 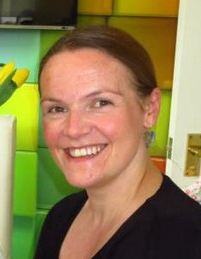 This is Claire’s story; her experience of researching and using online response systems. “Given the growth in student numbers in the Department of Computing, we were forced to move back to a more traditional lecture/seminar model for our first year cohort. My immediate concern was to ensure that the levels of student engagement did not suffer in the traditional lecture theatre environment with over 200 students. 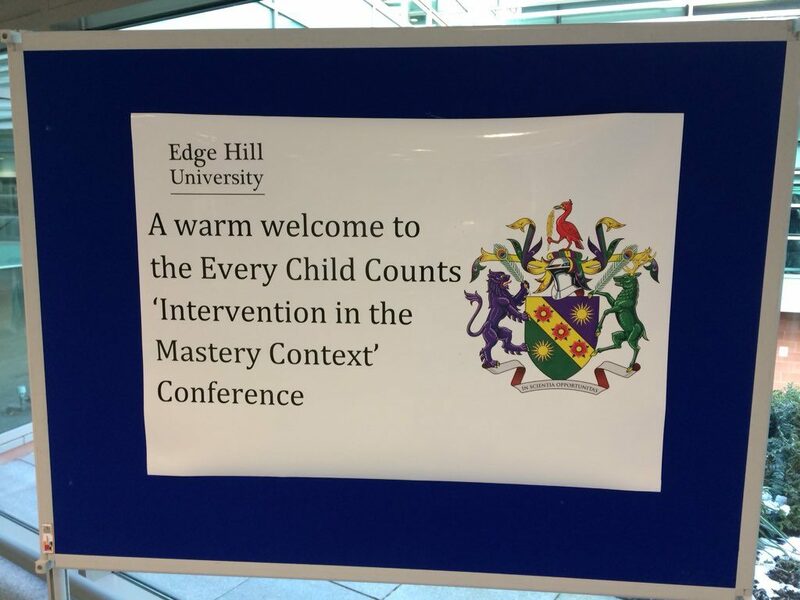 I started to investigate the options for increasing engagement in this kind of environment and first considered the use of the clicker systems available at Edge Hill. These were quickly ruled out due to the logistics of transporting them, and the fact that I immediately had to leave at the end of the lecture to teach another session. This led me on to the idea of using the students’ own devices such as their mobiles, tablets and laptops. A number of academic papers were available on the efficiency and effectiveness of this method so I began to identify and trial different student response app’s. I settled on Socrative for a few reasons, firstly it was free, I was going to have to use the application within weeks so I knew I would not get any funding within that time period. Secondly, the Socrative interface was very clean and intuitive, both for the students and the teacher. Socrative was implemented from the first lecture with the first year cohort in semester 1. Students had no issues downloading the app and were able to start using it immediately. My method of using the app was simple, I decided before the lecture at what points in the lecture I would like to test understanding or to encourage discussion. I then entered the questions in to the Socrative Teacher app before the session, meaning I could just click on ‘start’ on my phone when I wanted to release the first question. Moving between the questions within the lecture was simple and I was able to see responses from students in real time. I included roughly 2 or 3 questions per lecture across the 10 weeks of lectures. 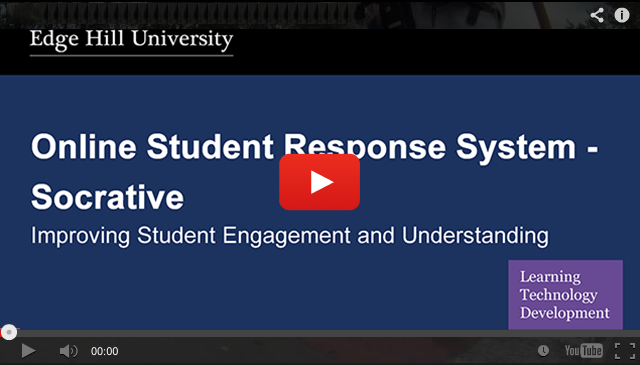 • It allowed students to respond anonymously, which was a very important factor for the increased engagement as it removed the fear of responding in front of peers that usually exists in large lectures. • It allowed me to test the student’s grasp of certain concepts immediately, and allowed me to save reports to follow up later. • It allowed real time interaction with minimal disruption on the flow of the lecture. • It allowed students to discuss what was being taught and work in groups to answer questions, thereby increasing their engagement. The student response to the use of Socrative was very positive, the data collected for the study demonstrated that students felt more engaged during the lectures, in comparison to the more traditional lectures they were also having that semester. It was clear that students very much linked the interactivity (with me, and also during their peer discussion) to their increased engagement. Anonymity was also a key factor that gave students the confidence to respond. If you feel inspired by Claire’s story and want to use this or another technology to help you enhance and support your own teaching, please get in touch with the Learning Technology Team in Learning Services. We would be very happy to work with you. There are a range of response systems that you might want to use with your students, including online ones like Socrative and Kahoot, handset based ones like TurningPoint, and even paper based ones like Plickers, which can work in situations where you don’t have access to a wireless network. Learning Technology Development have sets of Plicker cards which you could borrow. iSpring (a rapid learning authoring toolkit for developing professional e-learning courses in Powerpoint. Blackboard Collaborate (browser-based web conferencing solution). 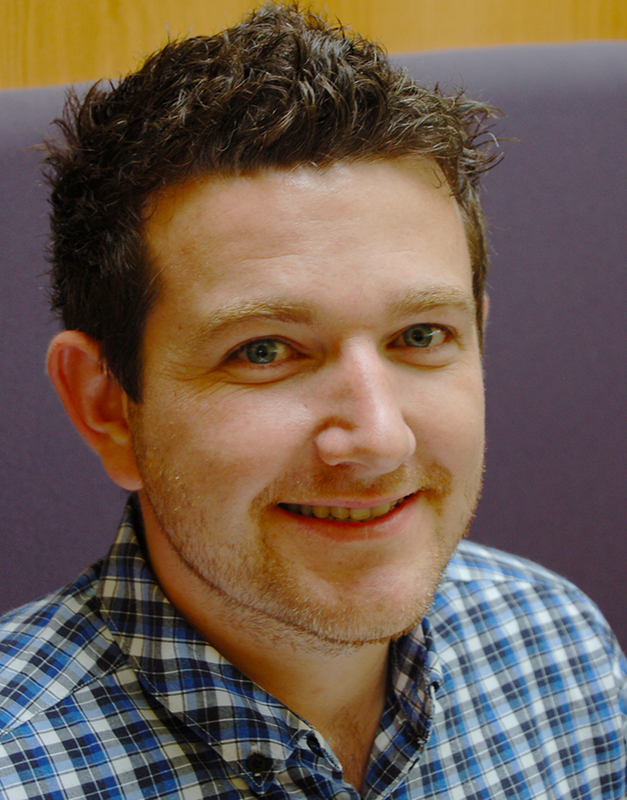 In this case study, Mark tells us about his work with the MaST Team and explains how and why they began to explore the available technologies, the benefits to the department and the students on the courses here at Edge Hill University. “For many years now I have worked with the MaST team. I’ve delivered various staff development sessions and raised awareness and confidence in using technology in teaching and learning. More recently I have worked alongside them in the adoption of new learning technologies such as iSpring and Blackboard Collaborate. As a Technologist I’ve always recognised the need to respond to the changing demands of the student expectation and of course the opportunity to collaborate with staff towards enhancing the learning experience overall with the use of Technology Enhanced Learning (TEL). Starting back in 2014, MaST explored the use of iSpring as a tool to develop and enhance their current online induction resource for students. Here they created an accessible and interactive course induction resource that included a variety of multimedia (audio narration, video guides, information & social media links and supplementary attachments) to give students the best start to the course and to accommodate for all the diverse range of learning styles of the online students. This project enabled me to not only reach out to academics, but to also understand and build even stronger relationships with the team and the course the MaST programme itself. It also demonstrated the benefits that the iSpring as a technology brought to the online student experience, highlighting the student rewards and usability for staff. Moving into 2015 and 2016, the MaST team introduced Blackboard Collaborate and Panopto into their programme. The team required a platform to support online lecture streaming and video capture. Prior to the institution having Panopto (lecture capture) at its disposal, the only tool that could deliver such an ability was Blackboard Collaborate. For those new to Collaborate, it is a real-time video conferencing tool that lets you replicate the physical classroom into a virtual one with the option to share applications and a whiteboard. Though Collaborate was not actually a dedicated lecture capture product and more of a online classroom tool, it did however provide a short term fix to live streaming for the MaST Conference days until Panopto was introduced in 2016. However, the benefits of the team using Collaborate prior to Panopto, actually worked in their favour for their future endeavours as they had already obtained an initial understanding of this tool it is now currently being considered as a communication platform for online group and one to one meetings with students. 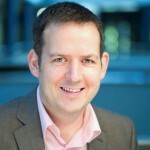 “MaST have been working with Learning Services’ Mark Wilcock for a couple of years on ways to develop and deliver blended learning session for our students, some of whom are based on campus with others at locations across the country. Initial trials with Blackboard Collaborate were very promising, this allowed us to offer face to face sessions whilst students in Birmingham were able to join the session remotely from a device or their computer. 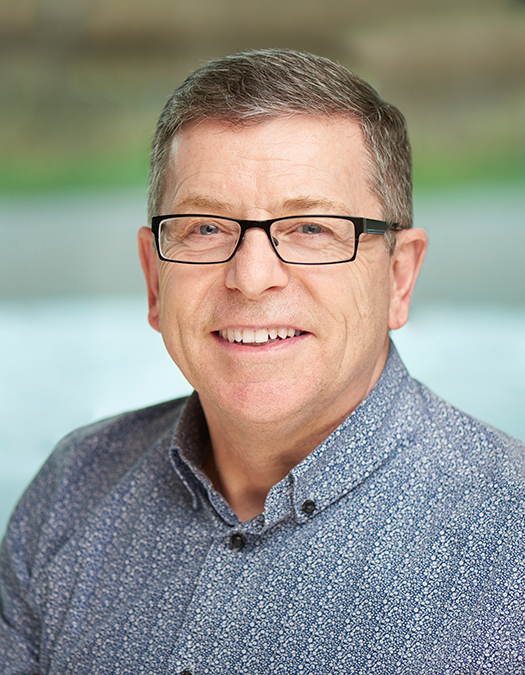 Working with Mark was also important in developing a number of iSpring packages which allowed us to create interactive multimedia e-earning content. As we grew in confidence, in terms of using the technology, we were made aware of lecture capture software. The MaST Team approached Mark again to find out more about this new resource called ‘Panopto’ to see what it offered as an alternative. If you feel inspired by Mark, the MaST Team and want to use these and/or other technologies to help enhance and support your own teaching, please get in-touch with the Learning Technology Team in Learning Services. We will be very happy to work with you. Kevin Henshaw is a Senior Lecture in Operating Department Practice, Kevin has been involved in a project piloting the use of Panopto software to record students performing presentations and clinical skill procedures for summative assessment. Panopto software provides lecture capture, screencasting, video streaming, and video content management solutions. 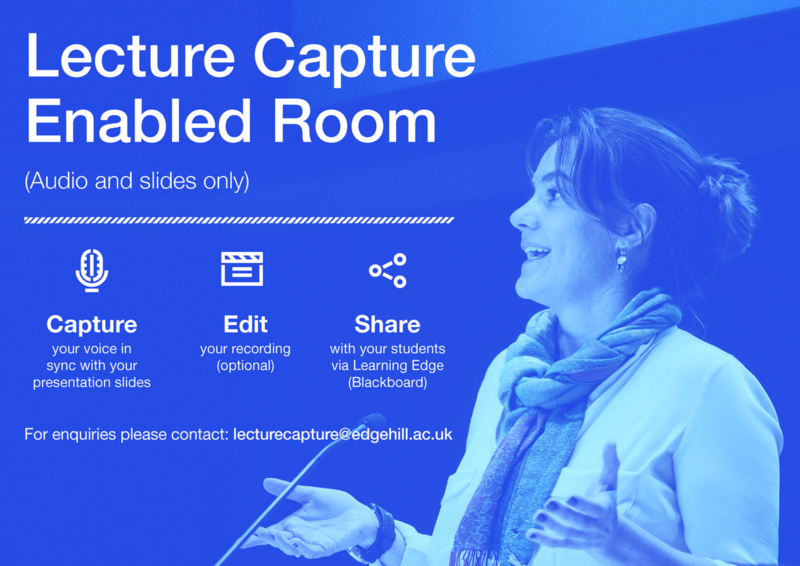 The Panopto lecture/media capture system is now available for use by staff as an additional learning tool for students at Edge Hill University. Panopto is incredibly easy to install and to navigate. The primary aim of Panopto is to provide a means of electronically ‘capturing’ lectures. As a part of my professional development I set myself an objective to develop a system of recording student activities such as presentations and other ‘soft skills’ (Skills Funding Agency, 2015. Carter and Wolmuth, 2010) which are seen as essential skills for students in Higher Education. Pinsky.et.al (2000) refer to a study by which students are given access to a recording of their presentation together with written feedback. Pinsky refers to ‘A picture is worth a Thousand Words’ and examined some of the practical uses of a combined approach to presentation feedback in Teaching. The addition of feedback to a recording is crucial and affords the student an opportunity to ‘see’ themselves perform while reading the feedback. Panopto allows this facility and a single hyperlink can then be sent out to individual students or, groups of students, which can then be viewed on a mobile device anytime, anywhere. can be attached to Panopto as a PDF. attached to Panopto as a PDF. If you feel inspired by Kevin’s story and want to use this or another technology to help you enhance and support your own teaching, please get in touch with the Learning Technology Development Team in Learning Services. We would be very happy to work with you. Last year the Professional Education Team started to explore current options for electronic submission at Edge Hill University. Mark Sutcliffe (Senior Lecturer in Professional Education) shares his experience of SafeAssign, part of the Blackboard Assignment Submission offer, in support of the challenges faced by students with academic writing. 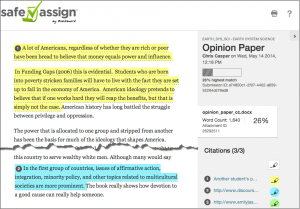 “Prior to using SafeAssign I had known about anti-plagiarism software for some time. However, neither myself nor my colleagues in the undergraduate team I work with had ever attempted to use it. I believe the main reason for this is that we had heard stories of the technology not being as effective as it originally was and sometimes working on an inconsistent basis. As somebody who has been eager to promote IT-related innovation within my area I have always been aware that technology can be as easily rejected as accepted, especially if the initial experience of using it is poor. In September of 2015 the team convened to discuss ways of further enhancing the effectiveness of practice, especially in relation to supporting academic writing, which often proves the most significant challenge to students’ studies. The additional ways that technology could help us and them was considered and following on from this I liaised with learning services to discuss ideas. A suggestion made by Martin Baxter and David Callaghan was SafeAssign, a recently integrated feature within Edge Hill’s VLE, Blackboard. 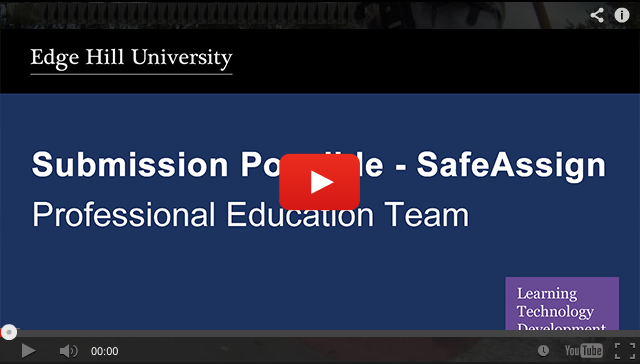 What quickly became apparent during the initial demonstration of SafeAssign was how straightforward it was to set up. A few simple clicks embedded this feature as part of creating a new assignment in a course/module area. However, what makes SafeAssign so effective is the way instructors and users can use this tool to check submitted work. SafeAssign initially provides an overall percentage, representing how much of the content connects to its global database, which includes uploaded work and published material. This can potentially provide a quick indicator of how much material has been used from external sources. In addition, SafeAssign generates a report, allowing instructors (and potentially users) to see exactly where such material has been used. I left the demonstration impressed with what I had seen and eager to promote the use of SafeAssign. At the next team meeting SafeAssign was discussed and demonstrated to my colleagues. It was trialled with work connected to a module submission in December of 2015. It was agreed amongst the team that we encouraged students not to view this technology with negative connotations, rather it was introduced as a supportive tool for their work. This was achieved through making sure that they could utilise the technology during the drafting process and self-check for any potential issues themselves. To assist in this process (and alleviate multiple submissions for a particular module) I created an additional submission point purely for drafts of work. You can see and hear Mark talking about SafeAssign and how students embraced the technology in support of their academic writing. 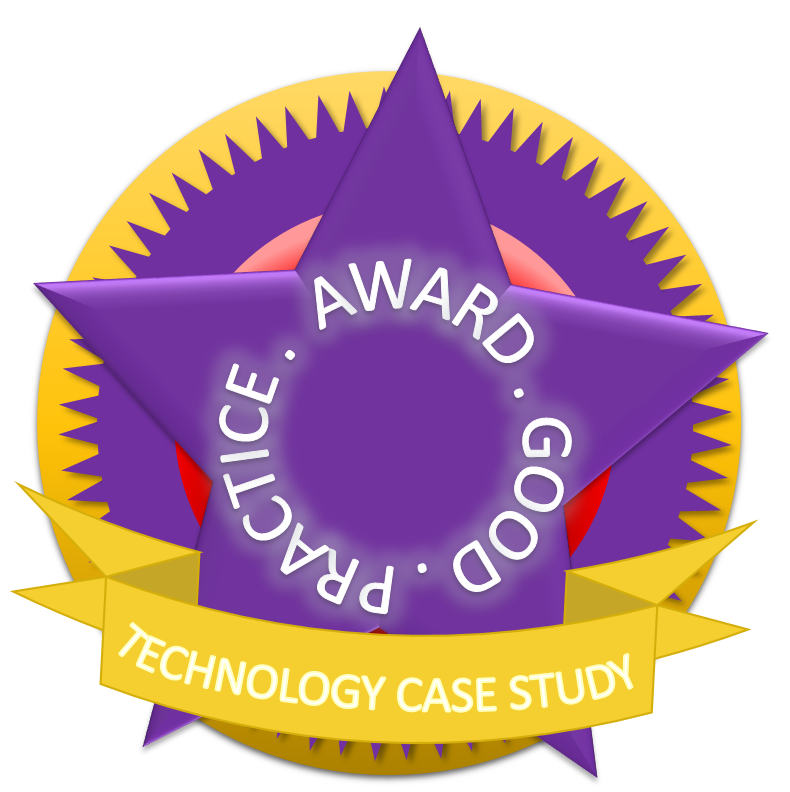 If you feel inspired by Mark’s story and want to use this or another technology to help you enhance and support your own teaching, please get in touch with the Learning Technology Team in Learning Services. We would be very happy to work with you. (Senior Lecturer in Professional Education). 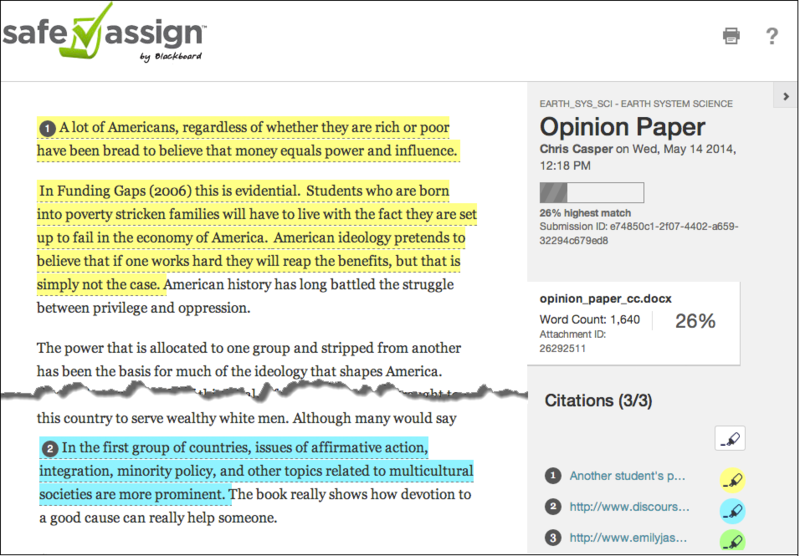 The Journals tool in Blackboard is a private space where students can post opinions, ideas and concerns. This case study, shared by Maria McCann (Widening Participation Manager), describes how the Journals tool was used within a research project, to understand the living, learning and emotional journeys of around 100 new students’ in their first term at Edge Hill University. When the Student Journal project was envisioned, Maria and the team hoped that a tool within the university’s virtual learning environment (VLE) could be used to help document the student journey. Maria felt it sensible to use, a system already set up, open to all students on any course, something that they would be getting introduced to anyway and would continue to use throughout the lifetime of their degree programme. To learn more about the Blackboard tools available to support student participation and feedback, Maria contacted Mark Wilcock, a Learning Technologist within the Learning Services, Learning Technology Development Team. 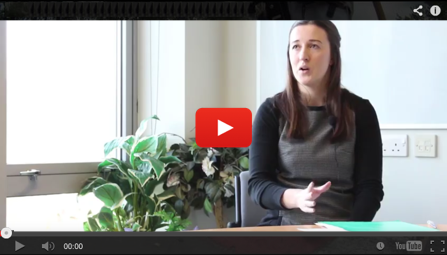 Maria met with Mark, explained her ideas, described what she wanted to achieve and what her key criteria were – she needed something that would allow students to record their thoughts in a single, secure place, that they could access anytime and anywhere. It was from this starting point that Mark (Learning Services) and Maria (Student Recruitment) were able to work collaboratively, to identify the most suitable tools and settings for her project. Mark recommended a ‘Blackboard’ Organisation, which is similar to a Course area but can be used for non-credit bearing activity to house the research activity, and the Journals tool, which would provide the private online space, for students to write and submit their journals each week. The Journal tool settings were also suggested as a way to ‘release’ and ‘lock’ the weekly journals, at the same time each week, to keep the students on track. It was decided to theme each week in a way that would be relatable to each individual student, regardless of programme studied. The themes were planned to mirror the systems, processes and services most students would experience and provided a ‘loose’ framework for students to base their journal entry on each week. Students were encouraged to think about key aspects of the theme and further guidance was given breaking down the themes into key points; however students were encouraged to think and write in depth, rather than trying to address all the points listed. Although the guidance was used widely by the students, it was not intended to be prescriptive and students were encouraged to think about what they had experienced in that particular week, their ‘journey’, rather than trying to ‘fit’ the framework. This was reiterated to the students in the briefing at the start of the project as well as emails and ‘posts’ to the organisation on Learning Edge. The benefits to providing a framework allowed quick reading and analysis for the reader. This combination of Organisation and Journals provided the perfect platform for the research. Participants (and the researcher) had 24 hour access via their tablet, smart phone, PC or laptop, as well as providing complete anonymity (except from the reader-researcher). Provide an equitable, consistent and seamless high quality experience for all students from first enquiry through to graduation. Provide services, systems and processes which are recognised as sector-leading nationally by prospective and current students and staff. To map interactions, activities and events where students engage with the university through its services, systems and processes- encompassing pre-enrolment and through the first 8 weeks of term as a first year. To understand students’ emotional responses, perceptions, views and behaviours in relation to those services, systems and processes. To provide a platform for students (as participants) to define what has the most impact on them and their learning experience (both ‘good’ and ‘not-so-good’ as defined by them). To identify areas of good practice across the university (at different student ‘touch points’) and make recommendations for further enhancement in services being delivered to students. Want to find out more about Blackboard’s Journal tool and Blackboard Organisations? Contact your Faculty Learning Technology Development Officer. Technology Supported Learning – Making Use of BoB! 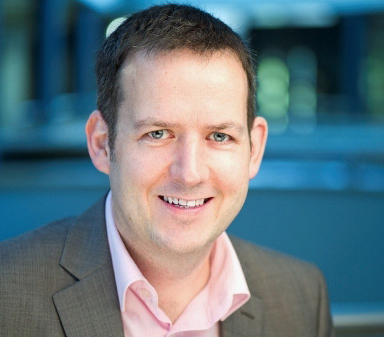 In this case study you will hear how BoB (Box of Broadcasts) National is enhancing teaching and module content. BoB National is a media rich online archive service that allows you to record and watch TV programmes from any internet enabled device including a Smart TV, PC, and mobile device. The services is widely available to staff and students here at Edge Hill University. 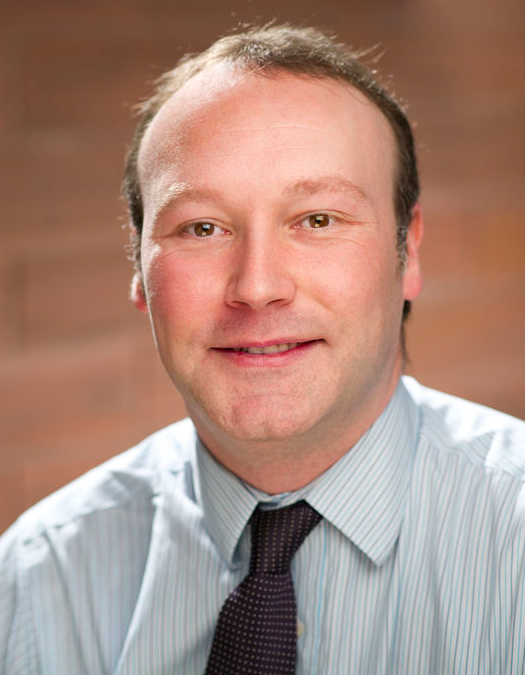 Charles Knight is a Senior Lecturer in Management in the Faculty of Arts and Sciences. Charles is a firm advocate of good technology, especially if it enhances his teaching and enriches the student learning experience. It was therefore no surprise to us that Charles saw, instinctively, the benefits of using BoB (Box of Broadcasts) National with his students. Charles makes extensive use of BoB (Box of Broadcasts) National to enhance his teaching and his use of Blackboard. 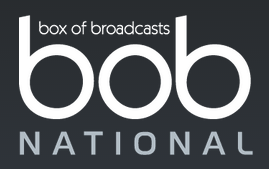 BoB (Box of Broadcasts) National is an innovative shared online off-air TV and radio recording service for UK higher and further education institutions. BoB allows both staff and students to choose and record any broadcast programme from 60+ TV and radio channels. In this short video, Charles discusses how he makes use of BoB and how it benefits both his own teaching practice and that of the students. He also discusses why BoB is a better alternative to making use of sites such as YouTube due to issues of copyright. During the video, Charles demonstrates how you can search and select content on BoB and then embed into Blackboard. The recorded programmes are then kept indefinitely (no expiry) and added to a growing media archive (currently at over 1 million programmes), with all content shared by users across all subscribing institutions. 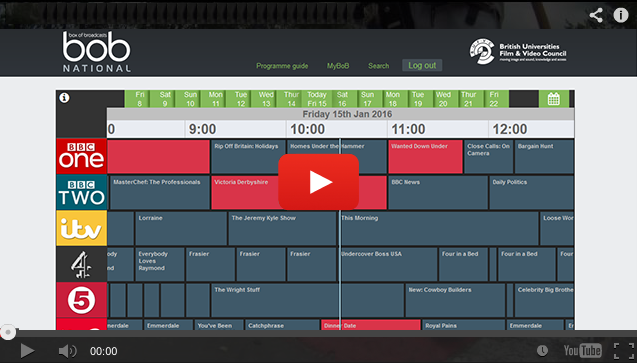 The user-friendly system allows staff and students to record and catch-up on missed programmes on and off-campus, schedule recordings in advance, edit programmes into clips, create playlists, embed clips into VLEs, share what they are watching with others, and search a growing archive of material. Want to find out more about BoB National, its growing media archive and how you and your course can benefit? Contact your Faculty Learning Technology Development Officer or look through our PDF guide.